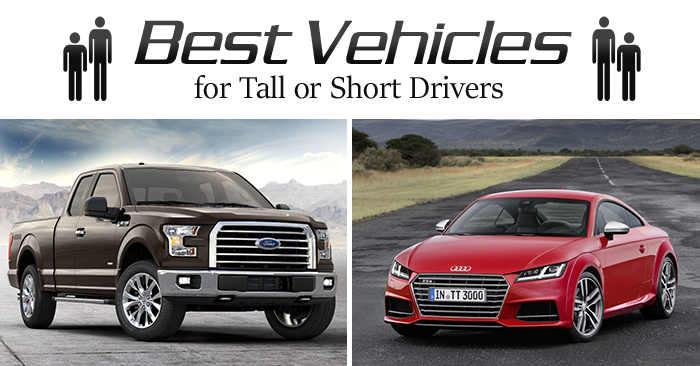 More than a car – more than a truck. 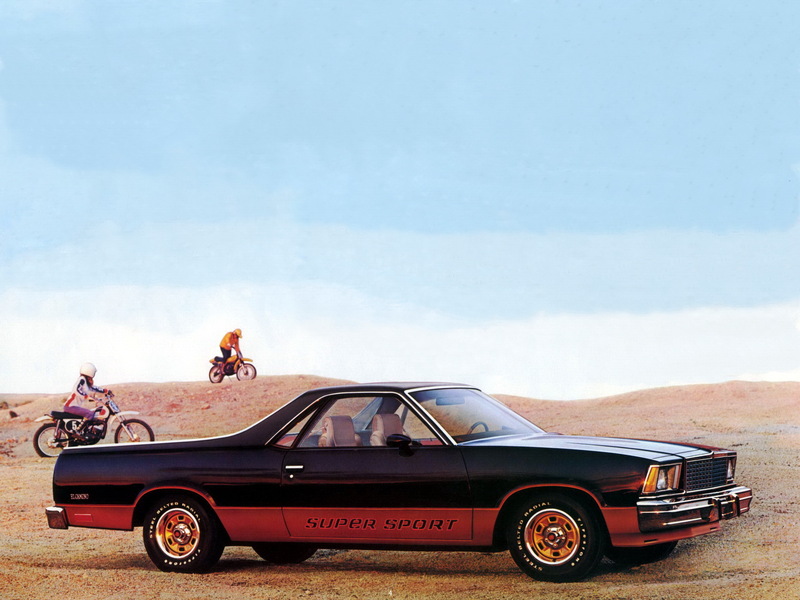 The Chevrolet El Camino was built tough enough to get chores done on the farm, yet sporty enough to run through the wash and cruise around downtown. In its prime, it wasn’t uncommon in the summer to see the truck bed full of people on their way to the lake. Or in the fall, seen powering through the field for harvest. The El Camino is a favorite for car enthusiasts and collectors, having identical performance to the Chevelle, but usually at half the price of other muscle cars and trucks from the era. 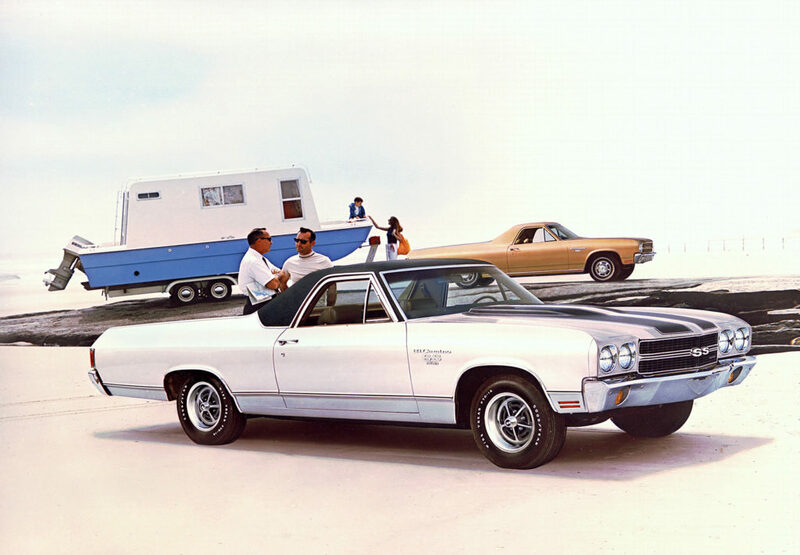 Let’s take a look back, through the years, at the Chevrolet El Camino. 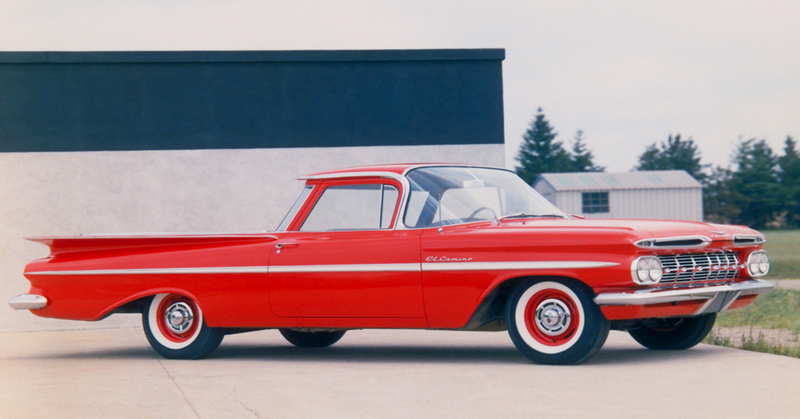 Built in response to the Ford Ranchero, the original Chevrolet El Camino was introduced in 1959 and touted as the “Handiest helper a family ever had!” The El Camino’s first run was short lived. 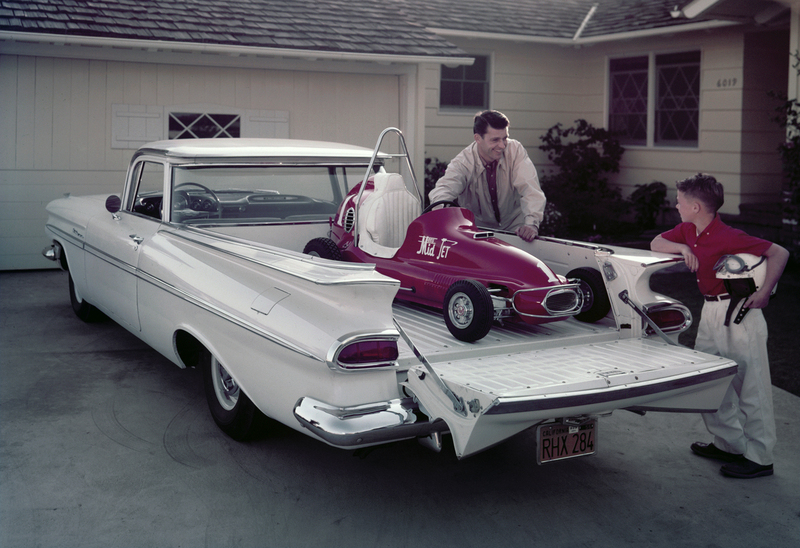 Based on the 1959 Brookwood station wagon platform, the El Camino came available with any full-sized Chevy drivetrain. It combined midcentury, finned styling with half-ton pickup utility. It made use of the era’s “cat’s eye” taillights with the interior and exterior styling of the Bel Air. The ’59 El Camino was the first Chevrolet pickup built with a steel bed floor. 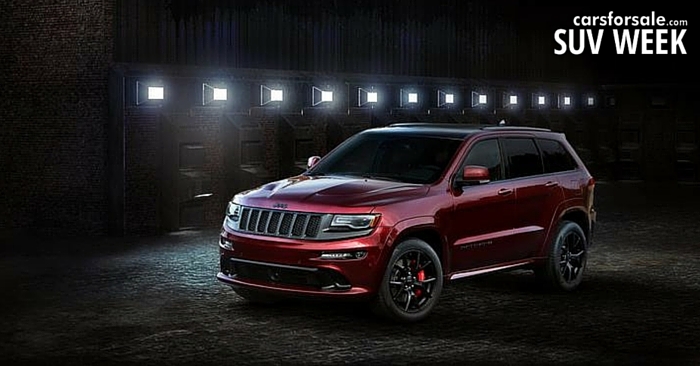 The most power it offered came in the 348 cu in, 7L V8 with 335 hp. Other engine sizes for the first generation were the 235 cu in, 3.9L straight-six offering 136 hp and the 283 cu in, 4.6L V8 offering 185 hp. It outsold the Ford Ranchero its first year, but 1960 was a tougher year for the El Camino, falling short of expectations. It would be placed on a 3-year hiatus after 1960. 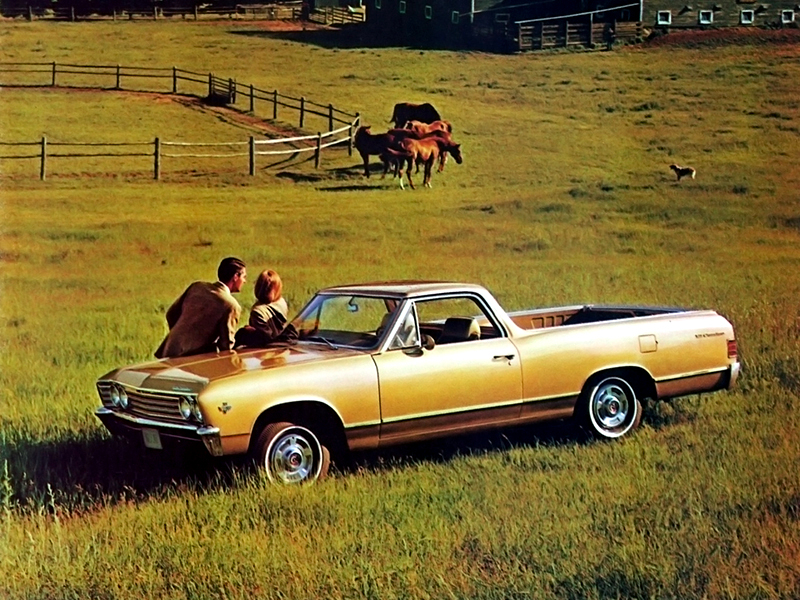 Chevrolet introduced an all-new El Camino in 1964. Revived in the muscle car era, the Chevelle-based El Camino quickly evolved even more over the next few years. Upping available horsepower to 375 with the introduction of the 396 cu in, 6.5L high-performance Big-Block V8 in 1966, the El Camino could sprint a quarter mile in 14 seconds. To add to the appeal of a truck that could make your friends eat your dust, it got the good looks and interior stylings of the Chevelle. Because the El Camino and Chevelle had matching SS396 engines available in 1967, many 1967 El Camino owners have “cloned” the 1967 Chevelle SS396 badges and trim to create El Camino Super Sports (SS), although the factory El Camino SS would not be introduced until the following year. Falling back a bit to its roots, the third generation El Camino was based on the Chevelle’s station wagon wheelbase. This introduced a longer El Camino with Malibu interior and exterior trims. The third generation saw many firsts. The new high-performance Super Sport SS396 version was launched as a separate model in 1968. In 1969, the backup lights were placed on the tailgate, and the Chevrolet 350 cu in, 5.7L V8 was used for the first time in an El Camino. The LS6 454 cu in, 7.4L V8 engine was used for the first time in an El Camino in 1970. This would be the largest, most powerful engine placed in an El Camino by Chevrolet, rated at 450 hp and 500 lb-ft of torque. The El Camino could now do a quarter mile in the lower 13-second range, hitting around 180 mph. New front end styling is introduced, giving the El Camino a squarer front end. In 1971, the El Camino became a cousin to the newly introduced GMC Sprint (later renamed the GMC Caballero). The vehicles would add the GM A.I.R. 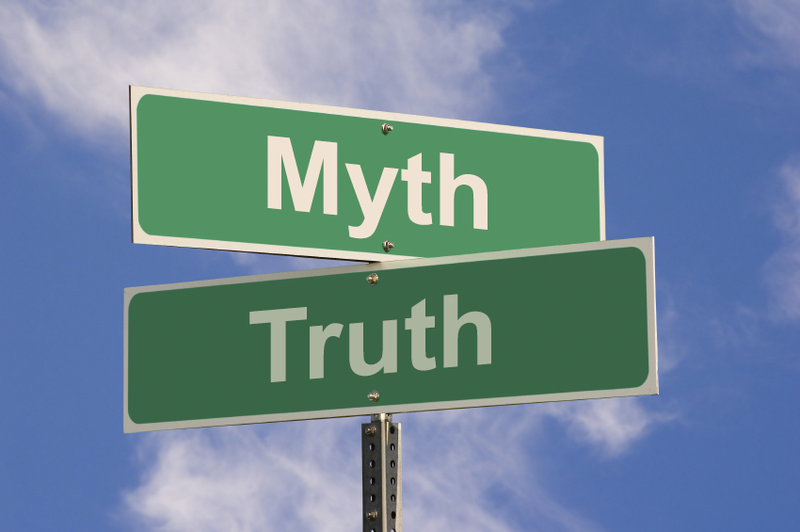 System to control emissions that year, as well as a reduction in engine compression as lower-octane fuel, was mandated. The largest El Caminos fall in the fourth generation and get a significant facelift and redesign. 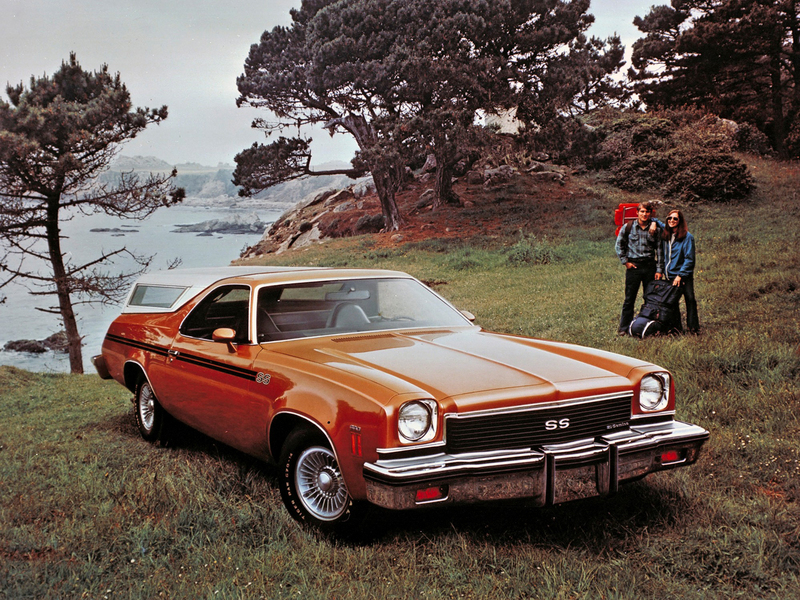 1973’s oil crisis would have a big impact on the midsize category going forward, and because the El Camino shared so much with the Malibu, it too would feel the effects. The base model and SS options continued to match the Chevelle line, and in 1974, the El Camino Classic was introduced, matching the styling of the upscale Malibu Classic. 1975 marked the end of the muscle in the El Camino. 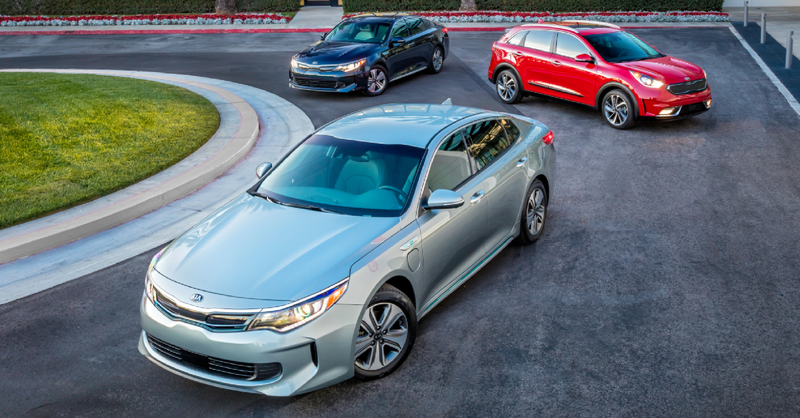 While it managed to hold out a little longer than its car counterparts, new SAE net ratings standards and trends toward more fuel-efficient cars ended the muscle car era. For the first time, the El Camino had a unique chassis, not shared with any other Chevrolet. 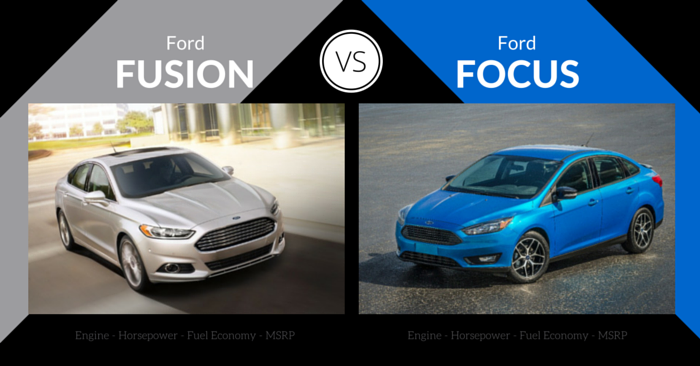 It would share side doors with the Monte Carlo and front-end, rear tailgate, and bumper with the Malibu Station wagon. The Classic, Royal Knight and Conquista trims allowed more customization to the consumer beginning in 1978. 1979 was the last year for the 350 cu in, 5.7L V8 option. Going forward, the 305 cu in, 5.0 L V8 was the biggest engine available. El Camino production moved to Mexico in 1985. 262 cu in, 4.3 L V6 engines became standard through 1987. The final El Caminos were 1987 models, although there have been tales of mythical 1988s due to some confusion around deliveries taking place in the 1988 calendar year. However, GM confirmed that no 1988 El Caminos were produced. Approximately 15,600 El Caminos were sold in 1987. Rumors have been circulating for years about the return of the Chevrolet El Camino. GM has produced at least two concepts since 1987, and to add to the speculation, GM renewed the “El Camino” trademark in 2012. The 1992 concept was based on the Chevrolet Lumina Z34. In 1995, another concept rolled out based on the Caprice Station Wagon. However, the platform was discontinued and the concept shelved. 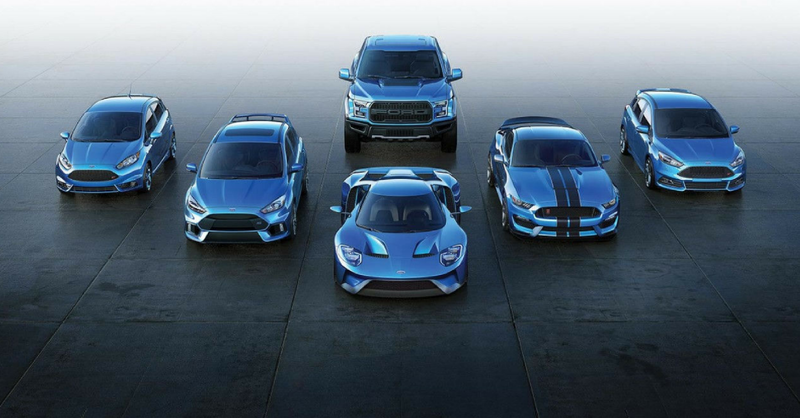 Other similar concepts, including the 1989 XT-2 truck and 2010 Pontiac G8 ST have surfaced but have not been produced. The Chevrolet SSR is a distant relative, based on the Trail Blazer’s platform. However, it was discontinued in 2006. 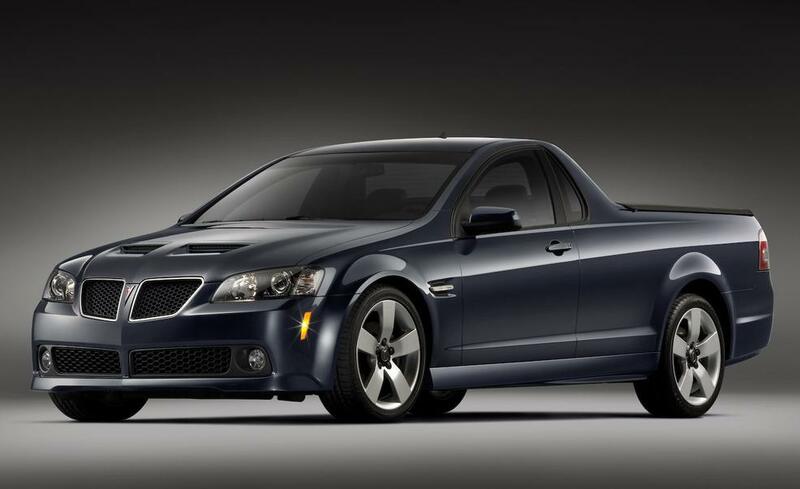 The 2010 Pontiac G8 Concept, referred to by enthusiasts as the modern-day El Camino. Cadillac produced a concept in 1954 with the name, El Camino. 1968 is only year the SS was its own model, known as the SS-396. If the VIN doesn’t end in an 8, it’s a fake. Most El Camino parts are interchangeable with the Chevelle’s of each respective generation. To determine if a 1972 SS454 El Camino is genuine, check to see if it has a “W” as the fifth character in the VIN. Kevin Costner drives a 1982 El Camino in the movie, The Bodyguard. The main character of My Name is Earl, played by Jason Lee, drives a 1973 El Camino. What’s your favorite El Camino era? Let us know in the comments!